The Mercedes E-Class offers a range of executive cars to suit all tastes, but not all wallets. The E-Class cars are high-end vehicles that lead the way with technical advances whilst maintaining a traditional appeal. Models include saloon, estate, coupé and cabriolets with petrol or diesel power. A diesel-electric hybrid model is set to follow. 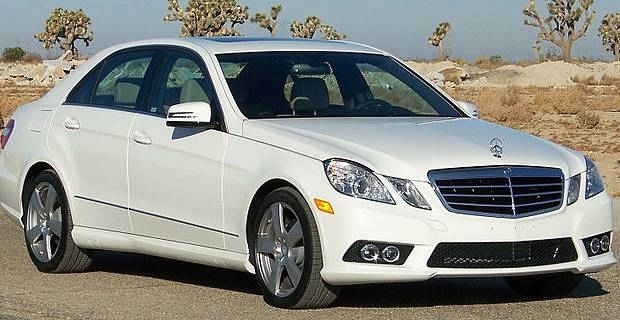 The E-Class saloon is the car that most of us think of when the Mercedes E-Class is mentioned. The current model offers the ride, handling and refinement that drivers have come to expect from Mercedes, but with the added advantages that Direct Control, which adapts shock absorption to suit the driving situation, and AirMATIC suspension have to offer. With a pillarless profile and sculptured looks, you don’t have to look hard to notice the difference between the coupé and saloon. The grille is more aggressive than the saloon or estate models and the Agility Control Packages that's fitted as standard help makes this E-Class the most dynamic of the range. Open-air motoring in the E-Class offers classic style and modern technology in one package. The soft-top is acoustically insulated to keep cabin noise to a minimum when the roof is up and the Aircap deflector system channels airflow away from the cabin when the roof is down. The E-Class comes with Electronic Stability Program and Brake Assistance as standard. Both help the driver to avoid accidents. Attention Assist is another feature available on the E-Class. This is a safety feature that notes if a driver is showing signs of fatigue. The system collects data from sensors on the steering wheel that detects the smallest change in steering wheel movement and the steering speed. The system collects data at the start of each trip to determine a baseline. Any deviations from this baseline cause the system to emit an audible signal whilst a message flashes on the instrument cluster. As you would expect from Mercedes, the E-Class is a byword for luxury and speed. It’s a blend of tradition and technology that has been part of the German car maker’s range since 1993. It shows no sign of letting up even though other newer models like the CL-Class and CLS-Class appear to have encroached on it market.